What is the MO Project contest? 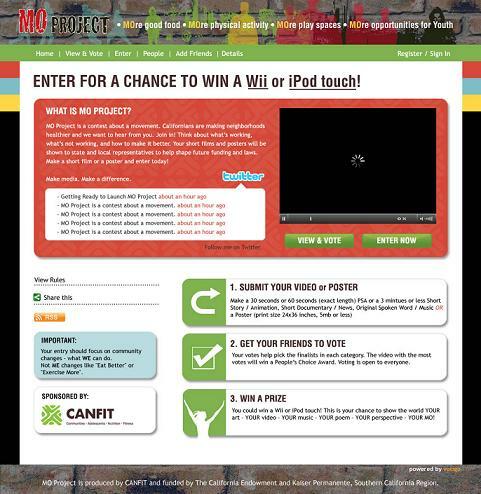 MO Project is a contest about a movement. Affordable, healthy food and safe & accessible areas for physical activity are scarce in many places. That’s why California is building a movement and we want to hear from the youth! 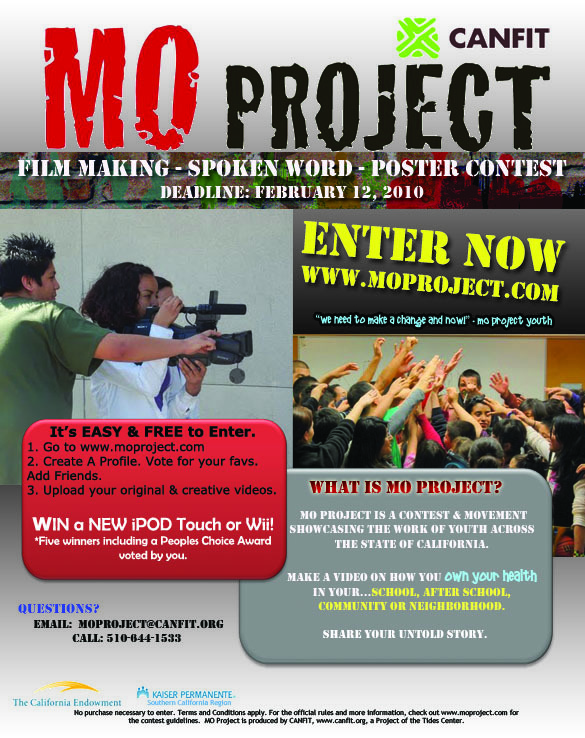 With funding from the California Endowment and Kaiser Permanente (Southern CA), CANFIT produced MO Project- a statewide online media contest for youth ages 13 - 18 who want to make a difference. Youth made videos, posters or spoken word pieces about what they wanted MOre of to improve the health of their community (i.e. change your school or after school food, start a farmer’s market, improve a park, eliminate junk food advertising). Watch the winning videos from MO Project Round 1 and Round 2 below. During the contest, CANFIT lead 8 regional MO Project Youth Convenings across the state of California. See where MO Project went. Watch the video to learn about the MO PROJECT movement! *MO Project Online Contest 1:MO Good Food! MO Safe Places to Play! MO Opportunity! On June 12, 2009, 30 youth winners were honored by Assemblymember Tom Torlakson at the California Childhood Obesity Conference in Los Angeles, CA. Read about the event. In April 2010, youth traveled from around the state to Sacramento, CA to be honored for their MO Project winning videos at the California Convergence Conference. Read about the event. Download the guide How to Talk About Food and Physical Activity. Interested in MO Project? Host a MO Project Youth Convening! Get Details. MO Project was produced by CANFIT and made possible by funding from the California Endowment and Kaiser Permanente Southern California region.